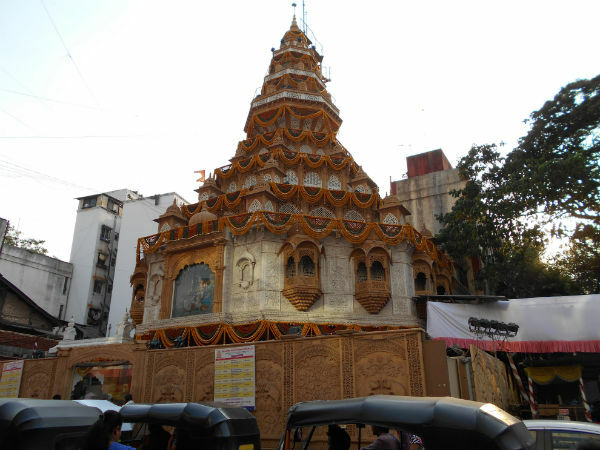 Dagdusheth Halwai Ganapati Temple elegantly stands at a corner of a busy Budhvar Peth in Pune. The tall temple tower shines amidst the overcrowded locality in the city. The story has it that this famous temple was built by Dagdusheth Halwai ( a confectioner) and his wife Lakshmi Bai when their only son passed away due to plague. It was from then on that Ganapati Festival was celebrated in a passionate way by Dagdusheth Halwai's family and other people in the neighbourhood. Dagdusheth Halwai Ganapati Temple has flourished over the years and today it is one of the most famous Ganesha Temples in Pune. After the inception of the shrine, it became popular for organising Ganesha pandals (poojas) and Ganapati Festival celebrations. The locality was known for making the festival a public celebration during the freedom struggle. As we enter the temple premises, there will be a queue which takes us inside the temple. If you happen to visit it during the peak hours, then you must wait in the line to see the grandeur of Ganapati here. Otherwise, the darshan will get over in no time. Devotees are allowed to enter from a side entrance. A few seconds into the hallway is the presiding deity Dagdusheth Ganapati. The beautiful idol of Ganesha is sure to amaze you. Since it is crowded most of the time, you won't be able to spend a lot of time in front of the deity. Those who are interested can sit and pray in the main hall in front of Ganapati. The exit is from the main entrance overlooking the street. In fact, main deity of Ganapati is visible from the road itself. One common sight is that anyone who passes by can see the God through the glass panes and get darshan from outside itself. Other attractions outside the main entrance is that of Ganesha's vahana (vehicle) a silver rat and two idols of Dwarapalakas on each side of the main door. There is also a small Shiva temple just next to the Ganesha temple. It is also said that this was an important place for social gatherings during the time of Indian Independence. It became a centre for social and cultural activities; that was when Dagdusheth Halwai Sarvajanik Ganapati Trust began and today it is one of the prominent institutions that helps a lot of people. Just outside the temple, there is a lane full of shops where you can buy sweets and Ganesha idols. So, don't miss out on visiting one of the oldest temples on your trip to Pune. By Road: Dagdusheth Ganapati Temple is in Budhvar Peth. It is a famous locality and it is well connected by road to all other parts of the city. By Rail: Pune Railway Station is 5km to the temple. By Air: Pune Airport is around 12km to the temple. Several buses and autos are available to reach the temple.